The Universal Orlando Preview is brought to you by Storybook Destinations. Storybook Destinations specializes in Disney and Universal travel, is consistently highly rated by our readers, and is owned by our own blogger extraordinaire, Tammy Whiting. Storybook also offers free subscriptions to TouringPlans to clients with qualified bookings. Hello again! 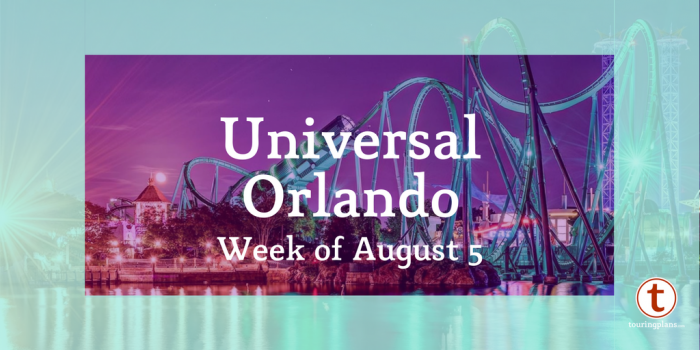 Time to check out what you need to know if you are visiting Universal Orlando Resort this week! 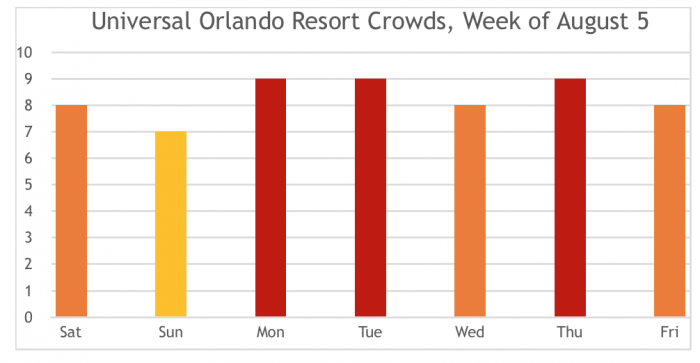 Crowds are not dropping just yet…but Sunday sure does look like the best day to visit this week! If a crowd level of 9 intimidates you, create a customized Touring Plan for a stress-free day! 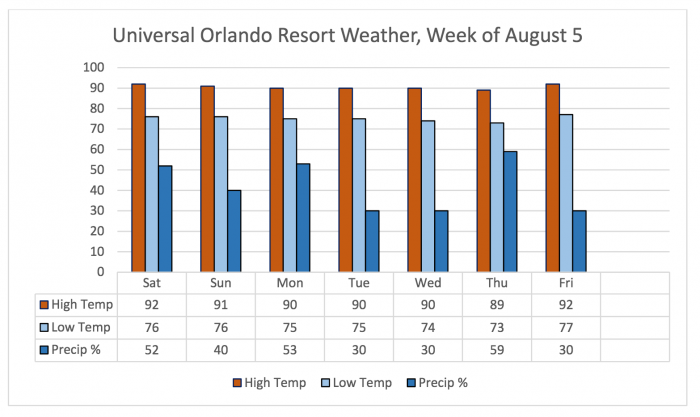 Weather in Central Florida in the summer changes rapidly – don’t forget to check out the latest forecast before you head out! On Saturday and Sunday, you can see Universal’s Superstar Parade at 7:00pm, and Universal’s Cinematic Spectacular – 100 Years of Movie Memories at 9:45pm. Monday through Thursday, the parade will continue to be at 7:00pm, but the Cinematic Spectacular will move to 9:00pm. CityWalk is still open until 2:00am daily, and self parking is free after 6:00pm. One-day base tickets to Universal Studios or Islands of Adventure runs you $124 per adult, and $119 per child (plus tax). 2-Park 1-Day tickets are $179 per adult and $174 per child (plus tax). A one-day ticket for Volcano Bay is $67 per adult and $62 per child (plus tax). One-day base tickets to Universal Studios or Islands of Adventure runs you $110 per adult, and $105 per child (plus tax). 2-Park 1-Day tickets are $165 per adult and $160 per child (plus tax). 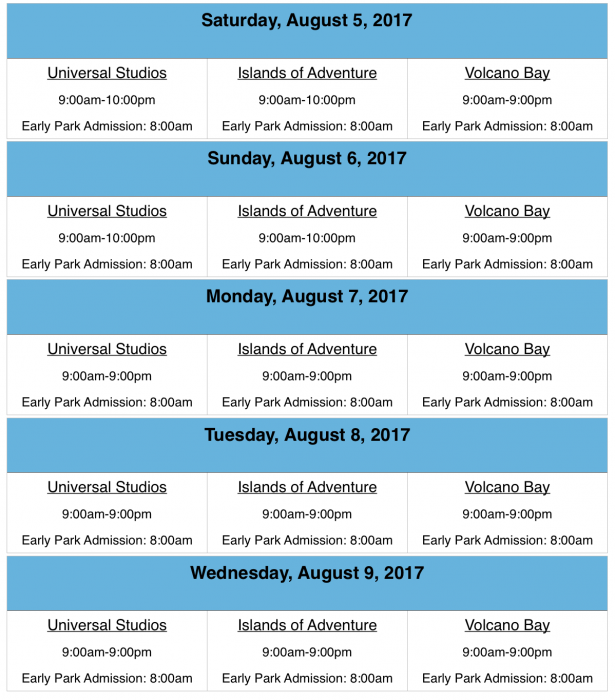 A one-day ticket for Volcano Bay is $67 per adult and $62 per child (plus tax). There are no planned closures or refurbishments scheduled for this week. You still have time to get in quite a few more runs on Dragon Challenge before it’s gone for good on September 5! So…are you planning to visit any of the parks this week? Let me know in the comments. Disney Tourist Manners: How Bad Is It? Yes coming Saturday and trying to fit in all the Harry Potter highlights (both parks) in one day. I would think the best approach is to do the newest rides with longest lines first, but the touring plan says to do many non Harry Potter things and then take the Hogwarts Express to IOA?! And come back and do Gringotts later? If you are staying at one of the on-site resorts, I’d take advantage of the Early Admission hour at Islands of Adventure and start your day there! There is a great Premium Touring Plan specific to the Wizarding World attractions, and you can optimize that to fit your specific needs too! Unfortunately we are not staying onsite so will not have early acces. We are driving up from Sarasota and parking onsite so we don’t waste time going to our hotel first (since leaving at 5:30am is going to be hard enough)! Is it best to copy the premium touring plan for 1 day 2 park access and then simply skip over the sites we don’t care about, or do you recommend using the app to see what real time waittimes are first thing in the morning? Thanks in advance for the input! If possible, it’s best to use a plan on the app. That way you can update it throughout the day to see things in the best order to avoid lines. Using a plan without the app is like having a map; on the app, it’s like using Waze.